In a touching sonnet that reveals much about the poet’s own sensitive, observant and imaginative nature Heaney outlines a feature of rural Irish community life, describing his first barber shop situated in the tiny home of a villager (Harry Boyle’s one-room, one-chimney house) where Harry practises his trade and sleeps conducts his private life (with its settle bed). The villagers refer to the hair-cut by its colloquial title – ‘a clip’. 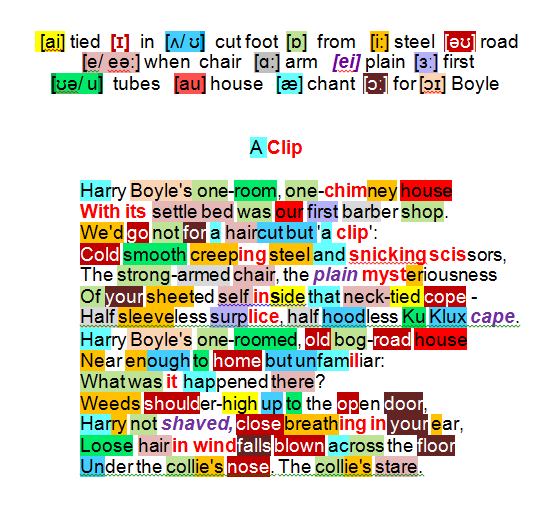 Heaney’s memories of the experience are rich in sense data: what he could not see he could feel and hear (cold smooth creeping steel and snicky scissors); what he could see (the strong-armed chair) held him firmly in its grip. The protective cloth placed around his neck spurred his fertile imagination (the plain mysteriousness of your sheeted self) – became, at one instant, a ceremonial vestment (neck-tied cope), now an altar-boy’s half-sleeved surplice and by stretching the imagination the half hoodless Ku Klux cape of a 1950’s southern-state American white supremacist! Heaney echoes the initial phrase as in his mind’s eye he mounts the path to the open door of the old bog-road house, close to home but not the same as home (unfamiliar). The cottage gives the man away: Harry lives on his own; he neglects his garden. Ironically, unkempt himself he smartens up his customers! His head gets uncomfortably near to the boy’s (close breathing in your ear). Harry is untidy – Heaney still sees the cropped hair, as abundant as fallen fruit in windfalls blown across the floor towards the barber’s dog (under the collie’s nose) . His emotional memory latches onto one thing in particular: the collie’s stare.